The coupe and the 1965 Ford Mustang convertible were the original two pony cars, introduced by Ford in 1964. The fastback model would come later, in the 1965 model year, which means that there were no 1964 1/2 fastback cars. But you could have one of the early 1964 1/2 convertibles or what's known specifically by enthusiasts as a true 1965 Mustang Convertible. For Mustang purists, if your car was equipped with a V8 engine, the only motor you would find in a '65 Mustang convertible would be the 289 cubic inch V8. If you had the 260 cubic inch V8, you would be referring to a 1964 1/2 model, although technically, both cars were classified by Ford as a 1965 model. It's simply an easy way for enthusiasts to classify the differences you see between the very early production cars with their "borrowed parts" from the Ford Falcon and the change to Mustang specific pieces that came later in the first year of production. There were some important differences in the car's frame and floor pans that did more than increase the curb weight from the coupe's 2,449 lbs to the convertible's 2,615 lbs. Chief among these differences were the addition of fabricated steel "torque boxes", which stiffened the chassis, helping to reduce inherent body flex caused by the lack of a strong steel roof. These torque boxes proved to work so well at chassis reinforcement, that later models, convertible or not, would include them. 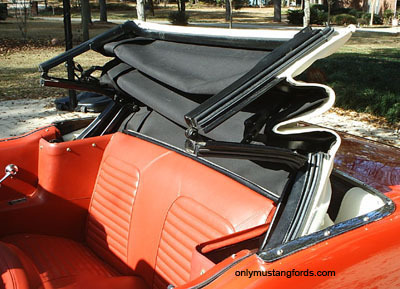 The drop top 1965 Ford Mustang convertible, was available with either the inline six cylinder engine, or the small block 289 or 260 cubic inch V8 (depending on production date). Check the link for the full 1965 Mustang engine specs. Three interior trim levels were available. Standard, Luxury and the rare bench seat interior. The late year introduction of the new Mustang GT package also included availability in the rag top and is still one of the most desirable of these classic pony cars. These early convertible Mustangs are also some of the most expensive restored pony cars you can find, along with the ever popular fastback models. Of the 559,000 Mustang's produced for the 1965 model year, only 73,082 Mustang convertibles were made. How many exist today isn't known. Ahhh! For the good old days! If you've ever wondered with so few restorable cars out there and a wealth of new reproduction parts and body panels, has any one ever built one from scratch? Well, the answer is yes. In fact, in Europe, where they are just as desirable, and even more scarce, a company has sprung up, that does just that, piecing together brand new convertible Mustangs. And Ford has started licensing for several years of early Classic pony cars, making it possible to build a brand new 1965 Ford Mustang convertible with a complete new body shell. And for a sum, slightly higher than the original MSERP (approx $15,995) you can have the pleasure of building up a car with no rust, damage or rotted out parts to replace. Available through most larger pony car parts sources or from it's manufacturer Dynacorn. There is also at least one company that I'm aware of, that will take a base 6 cylinder coupe and convert it into a convertible or fastback. It's apparently about half the cost of a Dynacorn body.